In a sandbox world, where you can do anything, everything, and possibly nothing, linear time seems not to exist. I can spend 12 hours in GTA IV and not even realize I have done nothing productive. Even in a game like Diablo 3, there is a certain amount of static time where you can literally do nothing to advance the story. As many games use this open world/linear story hybrid, it seems like a common consensus that doing otherwise would be bad in some way. Suda 51’s Lollipop Chainsaw decides to take you on a hilarious journey through the perspective of an 18 year old, scantily-clad cheerleading zombie hunter. 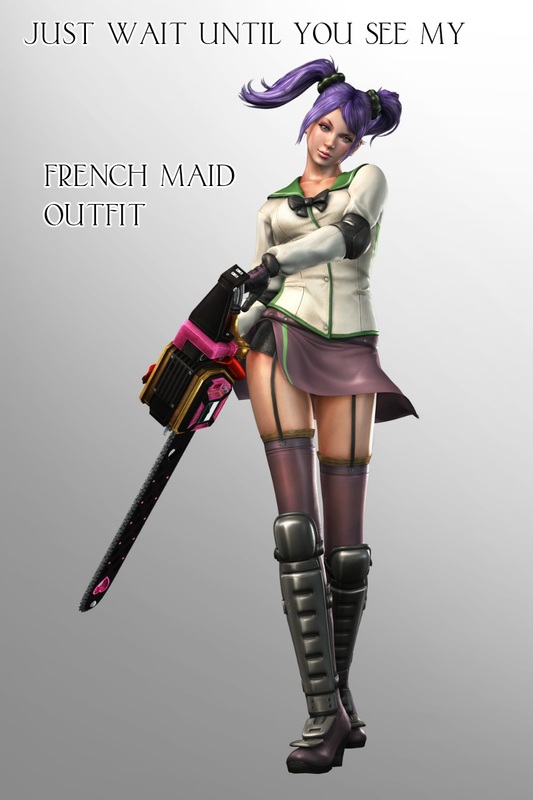 Yes, a big-breasted, high school cheerleader and zombie hunter. Is it worth the $60 investment? Let’s find out. Keeping tradition with unique characters, Suda 51, the company responsible for games like No More Heroes and Shadows of the Damned, followed the zombie trend with their own unique flair. With zombies being added to many recent games that don’t really need them, Lollipop Chainsaw emphasizes the characters and the dialogue. Juliet, the main character, starts off her birthday by chopping off her boyfriend’s head, turning him into a talking dialogue machine to hang on her hip. Coming from a long line of zombie hunters, Juliet uses her bedazzled chainsaw to chop off zombie heads while smiling and saying things like “OMFG.” The ridiculousness of that scenario is only a small portion of the hilarious antics in this game. Everything is over the top in Lollipop Chainsaw. Suda 51 let everything loose: The characters regularly spout vulgar obscenities, the levels go from a high school to a cathedral, and her town is more or less infected with a plague from hell that turns everybody into zombies. The dialogue and cutscenes are all wacky and exaggerated, but in a good way. Everything sets up the fact that, yes, this is a game where you are a chainsaw wielding cheerleader wearing skimpy clothes saying hilarious things for 9-10 hours. Even the bosses are silly, with different themed zombies like a rock n’ roll zombie. The story itself isn’t the greatest. It has a usual defeat the bad guy to make life all puppies and sunshine, and it seems a little off in this setting. There are a lot of cutscenes that are more or less fillers for advancing through an area and are usually pretty funny, but the main cutscenes between the levels feel slightly out of place, dealing out a more serious tone. When I’m playing through the levels smiling and laughing at the tongue-in-cheek dialogue, I expected the bigger CGI cutscenes to be more of the same. Instead, I got a serious, dramatic cutscene that didn’t really fit the character of the game. While some people might get offended by the games use of stereotypes, vulgar dialogue, and sexual innuendo, I found it hilarious. The fact that not too many games take that kind of risk makes this game a rarity when they tell a voice actor to say things like “What the d!#k?” When the story falls a little short, every small piece of dialogue, from Juliet talking to her boyfriend’s disembodied head to zombies shouting obscenities, makes up for it. Although I was disappointed in the length of the game, I feel like Suda made the right choice creating a 5-7 hour long story. If it went on any longer, all the gimmicks and characters would get stale and boring. Luckily, the gameplay is fun and engaging, with enough replay value to make going through the story again worth it. Like most linear action games, the bulk of the gameplay comes from killing lots of enemies with a lot of cool moves. In Lollipop Chainsaw, Juliet collects silver and gold medals which can be used in the shops located in each level. The shop lets you use the gold medals to buy more moves and upgrades to Juliet’s strength, health, homing distance, and recovery time. The silver medals are used to buy new outfits, MP3s to play on your playlist, and concept art for the levels and characters. Since there is a lot of stuff to buy, the replay value is mostly derived from playing the game over and over again on harder difficulties. Instead of starting a brand new game from scratch, you can just go back and replay each level to get more coins, buy more stuff, and kill more zombies. This kind of process to add replay value seems a little old-school compared to what other games are offering in terms of replayability. Aside from the aesthetic rewards like outfits and music, the various upgrades and moves available for purchase are worth going through at least a second playthrough. Since you keep your upgrades and moves when moving on to higher difficulties, it is useful to invest in them early. While there is technically a ”Good” and “Bad” ending, the only difference is about 12 seconds at the very end, so all that’s left after your first playthrough is better moves, more skimpy outfits, and cool music. The soundtrack in this game is something to note. As you progress, you collect mp3s and have the ability to form a playlist from your favorite picks throughout the game. With the music selection varying from Metal in the form of Five Finger Death Punch to dubstep and classic 80’s music, it is really fun to just listen to your five favorite tracks while slicing zombies in half. Unfortunately, your ability to change the music and use your playlist is only active in certain areas. Most of the time your playlist will be active, but it seems counter-intuitive to give the player the ability to change the music, then take it away because you’re about to do something important, or for no reason at all. Another fun collectible is the zombies themselves. Throughout the game you’ll have to fight mini-bosses with proper names like Carl or Daisy. After you defeat them you can access their “Profile” in your collection menu for a funny blurb about the zombie itself. Since certain zombies only appear in certain areas, and on certain difficulties, added replay incentive lets you take the opportunity to go another round with your bedazzled chainsaw. Overall, the actual combat is average. Unlocking new moves is fun and some are really satisfying to pull off, but Juliet can’t dodge a leaf falling on her head and pulling off some of the more complex combos can be a hit-and-miss affair when surrounded by enemies. Thankfully you can still laugh at it when Juliet can use her boyfriend for various tasks, like shooting his head at zombies or putting his head on a zombie to destroy boulders and dance like he’s at a talent show. I wish I could do more than just swing at zombies with a chainsaw or pom-poms. By the end of your first playthrough, you’ve set up the best moves bought so far and just repeat the same attacks over and over again to get to the next cutscene. A little variety is thrown in when your chainsaw turns into a shotgun, but even that gets pretty stale when the flashing neon signs tell you when to use it, or you just sit back and shoot at zombies with ease. I was surprised to find any multiplayer aspect at all, given that the story is short and the game itself does a good job of pushing your through it at a brisk pace. The multiplayer pretty much is just leaderboards, letting you brag about how fast you finished the game or how high your score was for a certain level. Each area completion comes with a score, reminiscent of Bayonetta, and that score can be put up on the online leaderboards. Time attack and other modes are more or less add-ons since the game really doesn’t need them. It is a nice addition and available for people to use. However, I wish that the time spent on developing this multiplayer would have been instead used to focus on possibly more areas, different endings, or improving the combat system somehow. 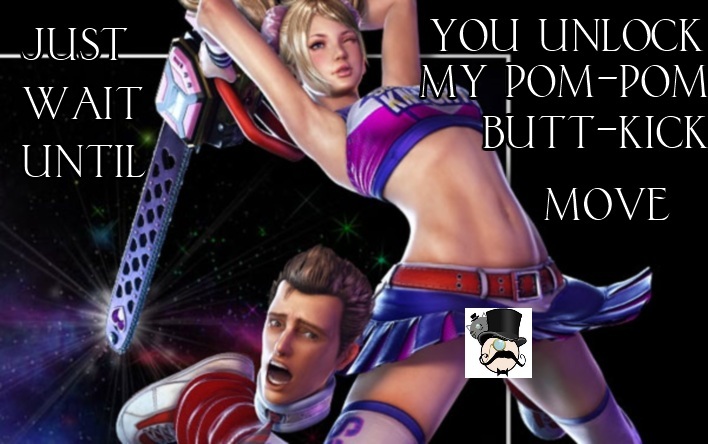 Lollipop Chainsaw had me more than once shouting “Are you serious?” at the sheer absurdity of the game. I’m glad I played it, because it serves a good purpose just being silly every once in a while. If you enjoy a linear story like Shadows of the Damned or No More Heroes, then I would suggest picking this game up, but not at full price. In the end, there just isn’t enough in this game to warrant a $60 price tag. I would suggest waiting a month or two when the game to a lower price. Trust me, the game isn’t going anywhere, and you’re not missing out on the next Uncharted. 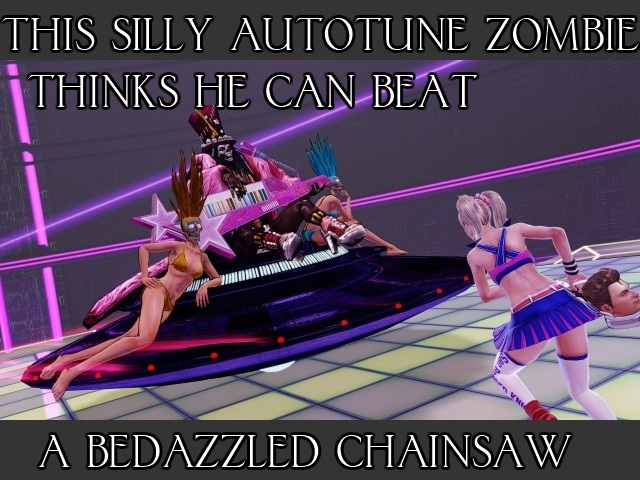 But if you have a random itch for something silly, scratch it by picking up Lollipop Chainsaw.